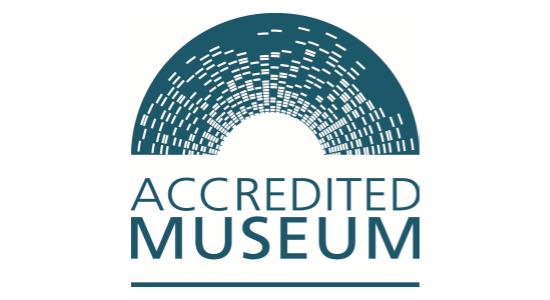 We love all our objects from a tiny Roman jet bear to large medieval stones too heavy to lift; from fascinating photographs of the past to wonderful paintings of Malton. Below is a selection of our favourite objects. 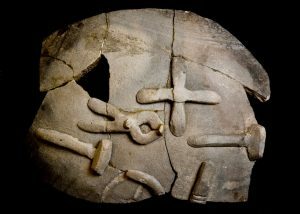 Our chalk figures, found in Malton, were made by the Iron Age people living in the area just before the Roman conquest. 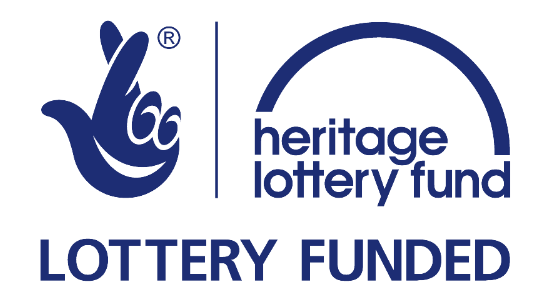 We believe they were only made in Yorkshire where over 50 have been found, all different but equally fascinating. 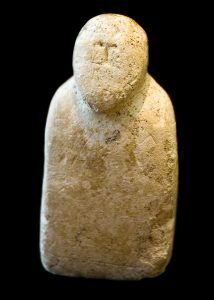 If you look closely you can see the face, a sword and belt etched into the stone suggesting they represent a warrior, but who owned them and why remains something of a mystery; found near a spring, were they an offering to a god, did they stand in a household shrine, were they children’s toys, or something quite different? They are often found headless! 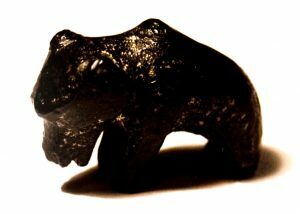 Found outside the Roman fort, this finely-carved bear is a firm favourite with our volunteers and visitors, particularly those of a younger age. It was buried with a child, probably to protect the child in the Underworld as mother bears fiercely protect their cubs. 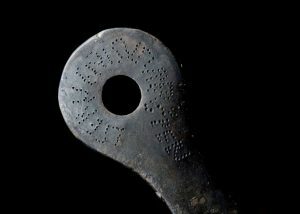 It is a rare and fascinating object as only a few others are known from Britain or elsewhere. This belonged to Lucius Servenius Super, almost the only Roman living in Malton whose name we know. Lucius may have been a soldier from the fort as soldiers carrying similar pans are shown on Trajan’s Column in Rome, and they probably used them for cooking as well as eating from them. The metal worker who made it, Alpicus, also engraved his name into the copper-alloy. His pride in his work is certainly justified – it still looks good enough to use. An important pottery industry developed in the civilian settlement across the river in the area of what is now Norton. They made these special pots with applied decoration and pots with faces on them as well as plain ones. 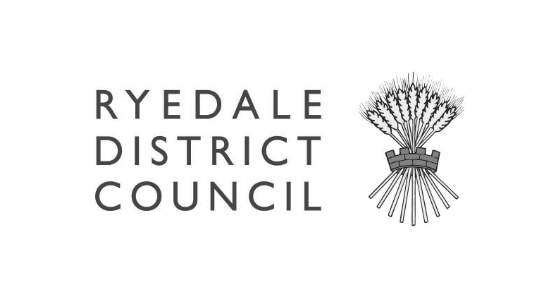 The tools, which may honour a local Smith God, are very similar to those of a modern blacksmith – once a good tool is perfected there is no need for change. 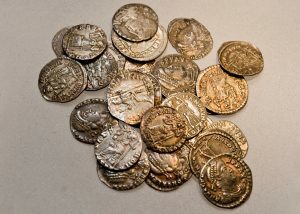 The museum holds an important collection of coins of all periods including this Roman hoard. Often beautifully made, the images on Roman coins can show unexpected information about hairstyles, ships, gods, and goddesses. 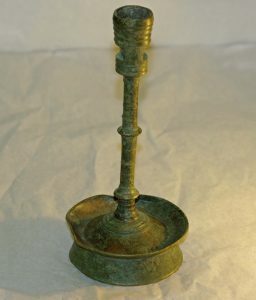 The owner of this fine candlestick, found in excellent condition behind a house in Wheelgate, Malton, was probably a wealthy merchant living in the town and perhaps involved in the lucrative wool trade. Similar sticks occur in late medieval paintings but they are usually damaged when found in excavation. 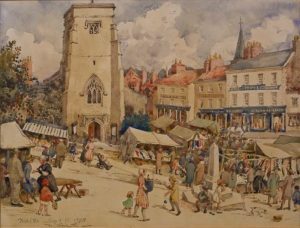 By an unknown artist, these delightful paintings, given to the museum by the late Nigel Hudleston whose family was associated with the town, depict the busy market square in the 1800’s. 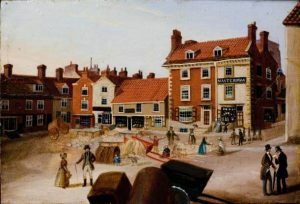 Although the transport and costumes, the goods for sale and games being played, have all changed over time, the buildings are still totally recognisable. Eating and drinking is essential as well as sociable and these jars represent the museum’s growing collection of objects associated with brewing, an important trade in Malton and Norton throughout history. 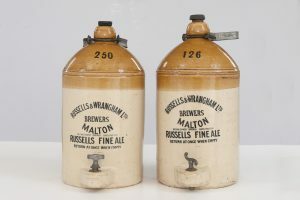 The inscription shows that these two jars, from a local brewery Russell and Wrangham, were meant to be returned for refilling but never were, and instead passed through generations of a family who donated them to the museum in 2015. Dorothea Forsyth (1882 – 1945) lived with her GP husband, in ‘Forsyth House’ which still stands in the heart of the market square. Dorothea was a skilled artist and needlewoman and the museum was delighted by her descendants’ gift of a fine collection of her needlework, including these beautiful dolls, and wonderful sketches and watercolours. 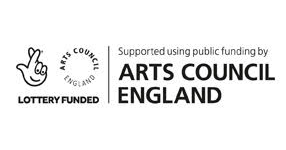 Dorothea’s work often depicted local scenes of the market town which makes us wonder whether the dolls were based on local personalities. They are individual and very different and appear to resemble different moods. The boots belonged to the famous horse rider and trainer Sir Guy Cunard. Racing was, and still is, very much part of local life in the area. Folklore attributes the origins of racing here to the cavalry troop based at the fort during the Roman period. Born in 1911, Sir Guy Cunard was a well-known figure, nicknamed 'The Galloping Major', who rode over 260 winners. 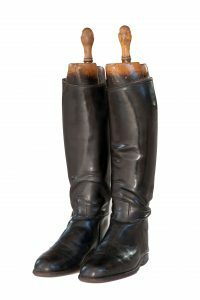 These boots, as well as a saddle, photographs, race cards and a weighing chair, are all now part of Malton Museum’s social history collection.